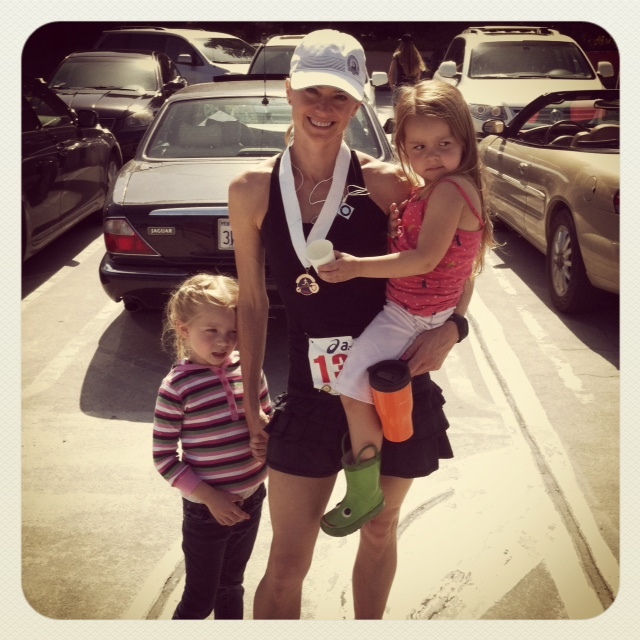 I am thrilled to feature this fit mom guest blogger, Heather. You can read more about how Heather balances her busy momma lifestyle and marathon training schedule at her blog, RunSylish. Heather, fit mom and marathoner. I am a wife, mother of two, runner since age 9, marathoner since 2001 and a woman who loves the way it feels to be stylish. In addition to running, I swim, love a tough ballet based core strengthening class and carry my 4 and 6 year old kids around way too much. My name is Heather and my blog is called RunStylish. While training for my first marathon I met my hubby. If you can meet someone sweaty running for hours, it can only get better. Right? The transformation from half marathon to full marathon clearly was life changing for both of us. Immeasurably so. Training for and completing our first marathon catapulted our running goal to the end-all-be-all Boston Marathon. Years of running, our wedding, the birth of our two beautiful children and one day it dawned on me that it was time to pick up the pace. The Boston Marathon was changing the qualifying times. Essentially they made the qualifying times 6 minutes faster and changed the registration process. 2011 would be a transition year when some, but not all, of those precious 6 minutes would be cut out. My husband and I picked our marathon and adjusted our lives to accommodate training with children. Training to qualify for the Boston Marathon was intense. With the qualifying times changing, we felt the pressure to really focus. Our pre-school aged children were our biggest fans and supporters. They understood our need for early weekend runs, learned the meaning of run support, watched our roller coaster of training highs and lows and learned about discipline. Little did we know that the two weeks before the race would be the most difficult. Thirteen days before our race I had an emergency appendectomy. Honestly, I thought it was food poisoning. Who knew? Clearly not thinking, I drove myself to the hospital that night. My amazing husband had to run the girls in the double jogger to the hospital the next morning. The good news for me was I had the surgery performed laparoscopically. The day I came home we took our 3 year old to the emergency room. She was not admitted then, but was the next day. She had pneumonia. Over the next week and a half my daughter and I gained our strength, our older daughter started kindergarten and we continued on with our plans to attempt to qualify. With the support of our families we pulled through, both managed to qualify for the Boston Marathon, and our family is stronger than ever. Thanks! You can find me at www.runstylish.com, on Facebook at RunStylish and on Twitter. The post looks great! Thanks Amanda!